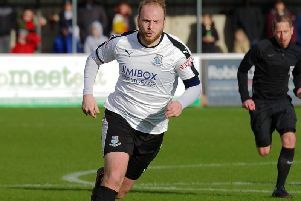 Two goals from Alistair Waddecar earned Bamber Bridge a deserved point against high flying Nantwich Town. Brig twice came from behind to draw level, in a game of high quality against opposition full of confidence. Micky Taylor’s side trailed at half-time courtesy of Sean Cooke’s close range finish mid-way through the first half, but Waddecar equalised with a lovely chipped finish with 20-minutes to play in the second. The visitors then landed Brig with the sucker punch when Joseph Mwasile fired in at the near post, only for Waddecar to hit back once again with a fine strike from distance. Across the whole 90 minutes there was little between the two sides, but it was the away side who almost took the lead on 15 minutes, when captain Matthew Bell volleyed inches over the bar with a fine effort from the edge of the box. But five minutes later, they did hit the front courtesy of the No.10 Cooke. Mwasile broke down the right with pace, rolled the ball across for Cooke, who kept his composure to roll the ball under Lloyd Rigby and into the back of the net. Brig rallied and created a number of good openings, but the only real chance of the half fell to Brad Carsley with ten minutes left. Callum Spooner’s cross from the right found it’s way through a crowd of bodies to Carsley, but the Brig frontman fired over the bar from a matter of yards at the back post. In the second half the hosts continued to dominate the ball and Dudley went close with a header, before the pressure eventually paid off when Waddecar drew Brig level. Chris Churchman played a splitting lofted pass over the defence and Waddecar, who beat the offside trap, ghosted in and delicately chipped the ball home over the onrushing Speiss. Given the work that had been put in by the hosts to equalise, it was a real body blow when Nantwich regained their lead five minutes later. Mwasile, provider for the first goal, found himself in space on the right of the box and fired in a powerful effort at the near post beyond Lloyd Rigby. You would have thought that would prove to be the killer blow, but Waddecar had other ideas. On the 83rd minute mark he picked the ball up just over half way, drove at the retreating backline and unleashed a thumping low drive across goal that nestled into the bottom left corner. Both sides then made changes in search of a winner, but it finished two apiece in a well contested clash in which both sides gave a great account of themselves.